Maintenance Service | RichmondBarr Electrical Ltd.
For first-rate commercial electrical services, RichmondBarr Electrical Ltd. is your number 1 choice. We are a full-service electrical company dedicated to servicing your needs with a comprehensive approach. Our company is well-equipped for managing all of your electrical maintenance and repair needs. Our goal is to create a commercial electrical system that guarantees safety and energy efficiency. We work to provide you maximum productivity. Our retail and commercial electrical maintenance services provide extensive coverage of all your electrical concerns. We aim to stay updated with the latest advancements and combine these with our experience in the field to give clients exceptional electrical maintenance services. When you call RichmondBarr Electrical you receive commercial electrical services you can trust. Our Hamilton-based electricians are trained, licensed and fully-knowledgeable. They are dedicated to supplying all clients with the highest level of service. 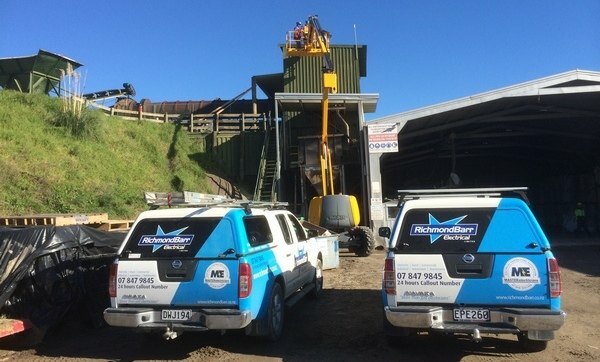 We offer fast response to breakdowns and faults in warehouses, manufacturing plants, and Commercial Property’s around the Waikato area. Our expertise in Emergency Lighting includes but is not limited to commission and maintenance of emergency lighting systems, making us one of the few electrical companies that offer this service nationwide. We also offer a wide selection of commercial electrical services and we make sure we cover all your requirements. All of our electricians and employees are Site Safe qualified and equipped with full and up-to-date OHS policies. Our team offers over 200 years of combined experience, assuring clients that we can deal with big or small-scale requirements from you.